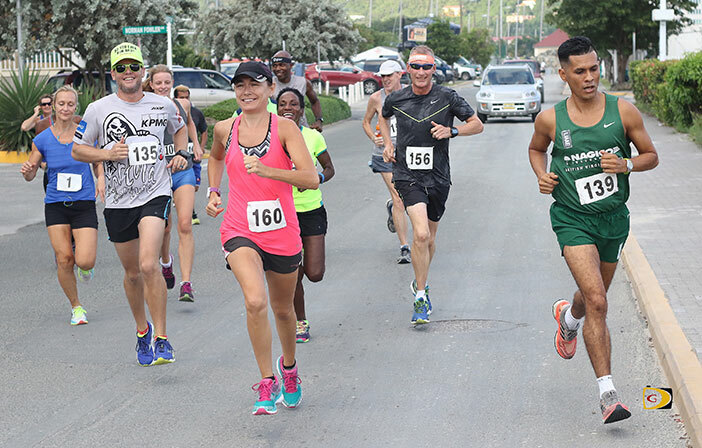 The road to the Ceres Juices 10K Series overall crown came down to an important decision in the final race. With both of them tied on points and the winner earning the crown, Stoby decided not to go to Virgin Gorda. Farley said he knew he had to set his own pace and knew it would be a good race with Stoby, who wouldn’t give up. Final Results. Men: 1. Reuben Stoby, 38:55. 2. Julius Farley, 39:20. 3. Adrian Dale, 47:39. 4. Zebalon McLean, 48:57. 5. Patrick Ormond, 48:59. 6. Iswar Persad, 49:45. 7. Richard Morgan, 49:51. 8. Charles Kerins, 49:58. 9. Claudius Rymer, 54:25. 10. Matthew Howson, 54:41. 11. Ruairi Bourke, 57:17. 12. Dennis Versoza, 57:33. 13. Gabriel Obregon, 1:03:42. 14. Dennis Delacruz, 1:03:59. 15. Bill Kinkead, 1:04:37. Women: 1. Maria Mays, 44:22. 2. Juliane Potgieter, 49:47. 3. Rachael Mayo-Smith, 52:13. 4. Rosmond Johnson, 52:37. 5. Melisande Rowe, 52:57. 6. Katrina Lindsay, 54:42.. 7. Kay Reddy, 57:59. 8. Karrina Stead, 59:32. 9. Rachael Mathews, 1:06:16. 10. Claire Santillan, 1:08:47. 11. Saungie Liburd, 1:15:54. 12. Mitchelle Jalova, 1:16:22. 13. Rovelyn Dimaala, 1:16:23.39. 14. Nedy Ador Dionicio, 1:17:13. Also participated Julie Schneider.